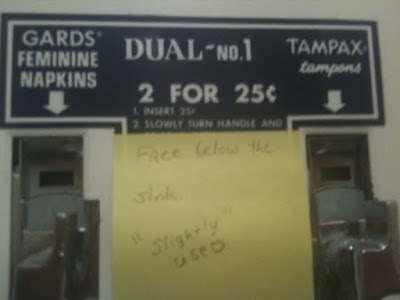 The “Blog” of “Unnecessary” Quotation Marks: WHAT?? I don't even want to know what's below the sink. Used in any way? Sounds terrible. Thanks, Caitlin. I'm guessing the establishment didn't put up that sign. Someone "slightly" used a napkin and then thought it would be a shame not to conserve. Even I don't go that far. Not that I as a man would have this particular option anyway. That is just.... I got nothin'. Ick with a capital "I"
Pretty sure that one was using the quotation marks in a purely ironic sense. To me, that is an absolutely proper use. At least some people got that the quotes are being used correctly here. OooooohhhhhhKaaaaaaaay. That one made me laugh aloud and snort milk outa my nose.